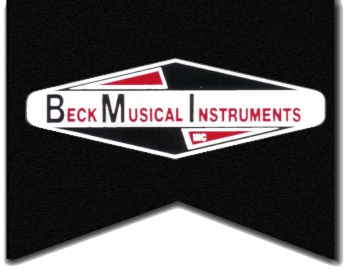 What made Zane Beck’s sound so unique? His copedant. Yes, this is a universal tuning, probably the most compact universal tuning with the least amount of floors and knees. With just 4 floors and 5 knees you will find you get not only standard E9, B6 and E7. So if it so good, why dont more players switch? Very simple! “Set in their ways” Is the best explanation we know. Also, their is very little tabliture available, which detracts from it becoming a popular tuning. The biggest issue we hear from players is that they don’t like the grip for E major chord which is strings 1, 3, and 5. This grip is a little different but you are still able to get all the great licks, and yes it is all there just in different places. If you want to try something a little different, give this tuning a try. 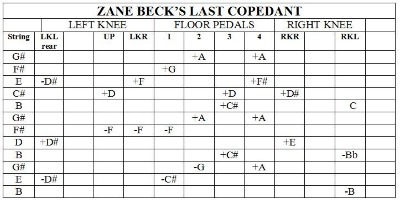 According to Don Fritsche, prior to Zane's death he was working on making more changes to the Copedant. 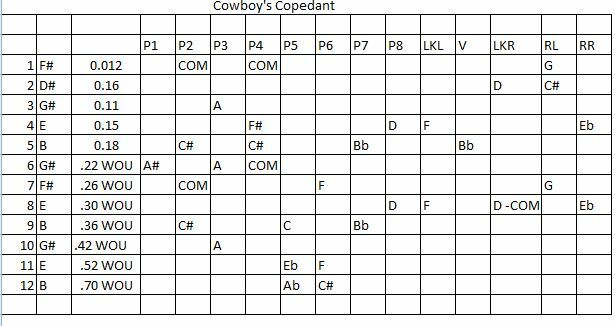 What is the secret to Cowboy’s playing? According to Cowboy, it is the first pedal that makes his sound unique. 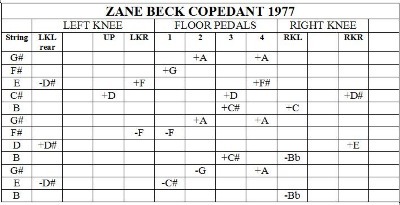 Study the copedant, and you will see that there are not many differences other than the placement of the A# in the first pedal.